It is also possible to have ’The best of Both Worlds’. Where the advantages of both -d- and -e can be combined to arrive at the most cost effective, tailormade solution for your industrial heating requirements. Pressure vessels or a combination of vessels form an intergral part of heating units in many appliances. 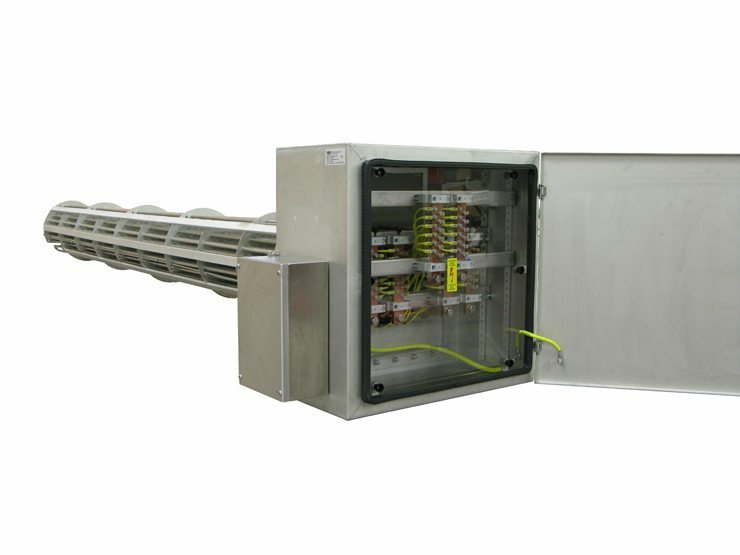 In the shell, explosion proof batteries can be mounted up to 36” outer dimension. Vessels can be designed in accordance with several codes as Stoomwezen ”Rules for pressure vessels”, AD-Merkblätter, British Standard, ASME, PS 5500 etc. and in accordance with the PED directives. Mostly the heating units are deliverd complete with a total control system. 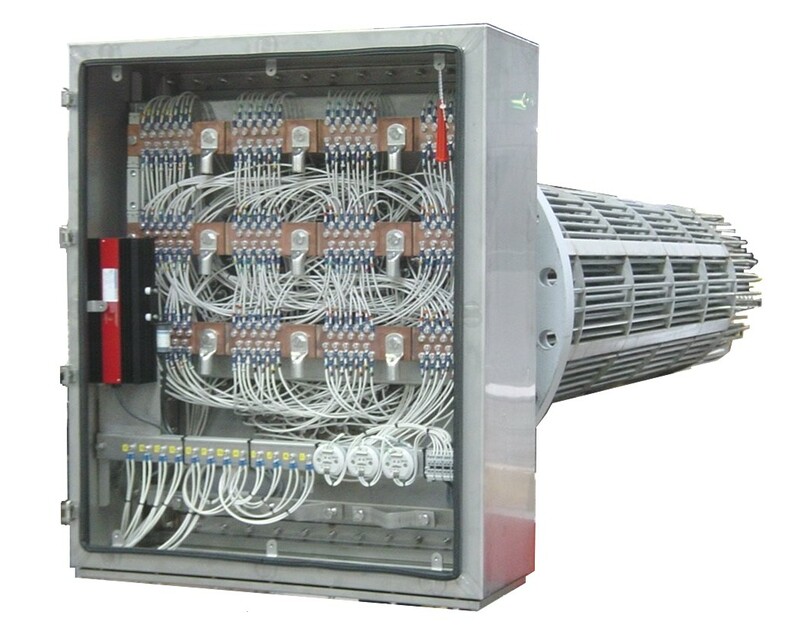 To ensure complete compability and optimal design, the complete engineering and manufacturing of both heating unit and control system is preferable. Is applicable for heating up liquids and gases. 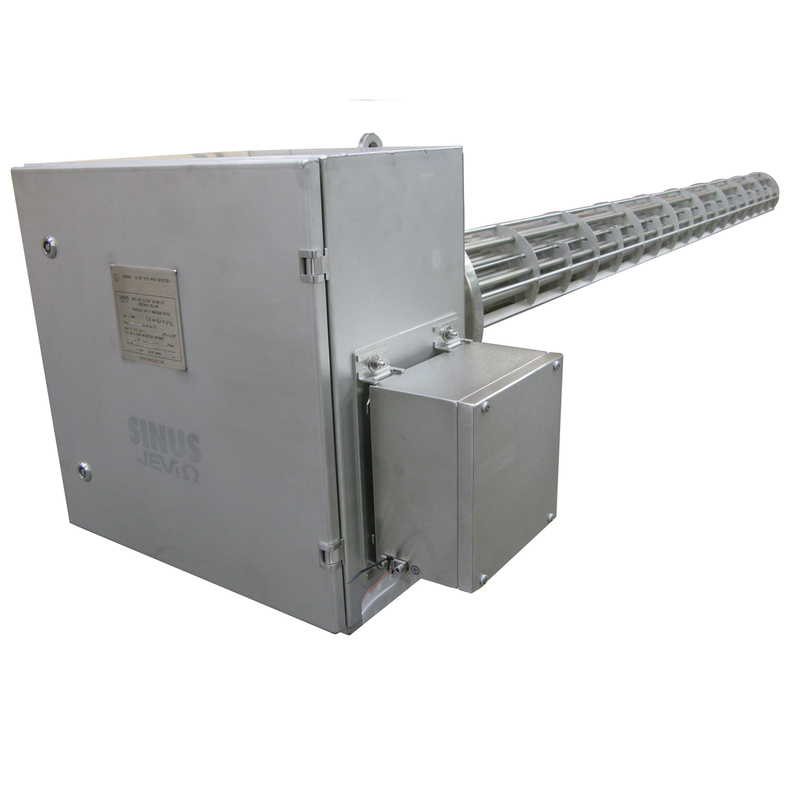 The material of the standard certified increased safety enclosure is stainless steel. – Up to 36” flange acc. ANSI B 16.5; material carbon steel, high alloy steel, nickel alloy, monel etc. – diameter of heating elements: Ø8.5 mm, Ø10.2 mm, Ø12.7 mm and Ø16 mm or cartridge heating elements Ø12.5 to 31.5 mm. – material of elements: high alloy steel, nickel alloy and copper alloy. – immersion length up to 3000 mm: see table. – retractable heating elements by means of carbon steel or stainless steel compression fittings/bite couplings or cartridge heating elements. – baffle plates material: stainless steel. 1) Protective and/or control devices: thermostat, thermocouple or pt100. 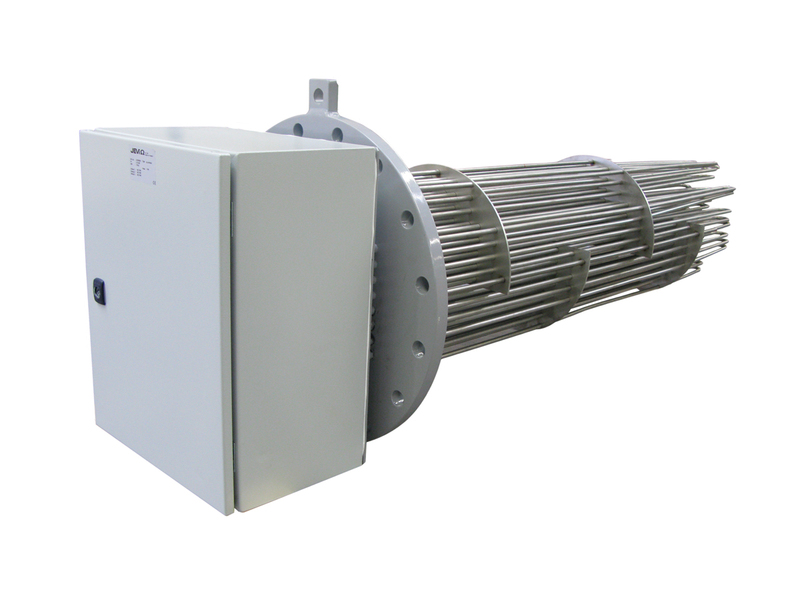 The maximum allowable energy-dissipation of the tubular heating elements has been based on a maximum Watt-density which is physically depending on the fluid temperature, type of fluid and process condition. The temperature setting of the safety device has to prevent that the maximum temperature shall not exceed the temperature class. 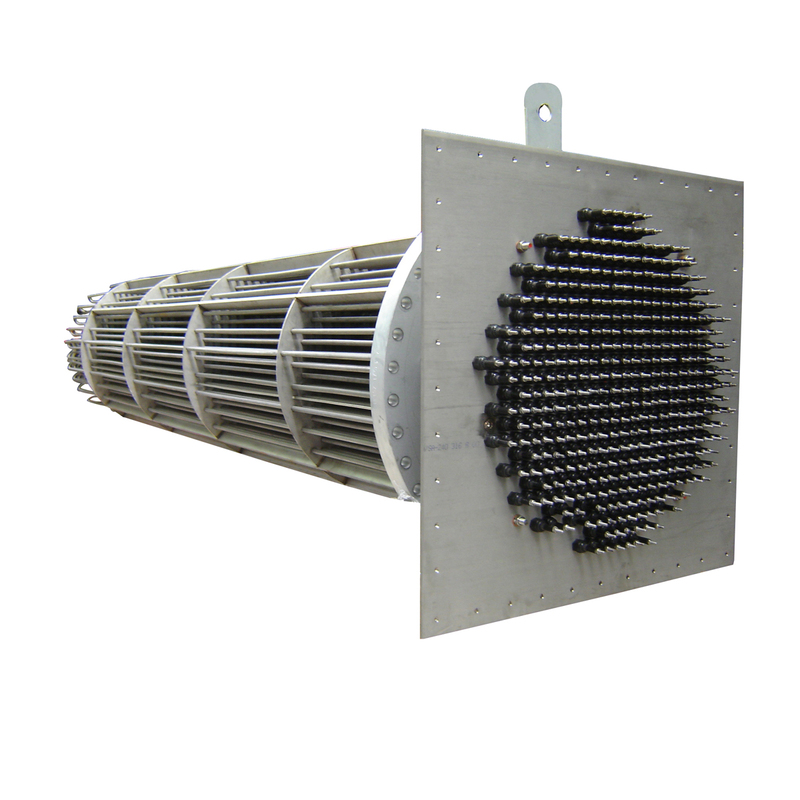 Sinus Jevi designs, engineers and manufactures complete explosion-proof heating units for industrial appliances, according to customers specification.